New Milford Sign Shop is a full-service sign shop serving the New Milford area since 1976. Born and raised in Bridgewater, CT, Walter Von Egidy graduated from Syracuse University in 1982 and began sign painting for commercial clients shortly after earning his university degree. He acquired the New Milford Sign Shop in 1984. Since then, Walter's signs and logo designs have helped set the standard for area companies seeking to draw attention to their businesses and bring in customers. His presence as a designer, craftsman and artist is well established in and around Litchfield County. He is known for his creative talent and experience and as a long-standing member of the New Milford business and arts community. To find out about our sign-making services, call us at 860.354.1316 or email us at wve3829@charter.net . 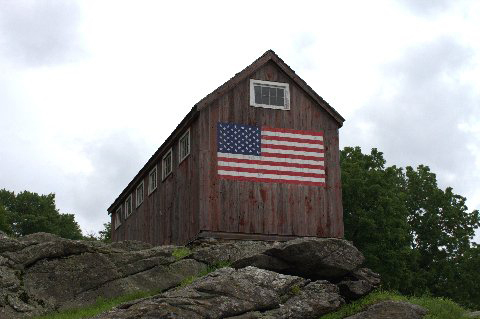 The flag mural painted by Walter Von Egidy on the barn shown here is a familiar sight to Bridgewater residents. Viewed from the roadside, many residents and visitors stop to photograph the scene.